WMAP First-year Paper Figures, Verde, et al. Ratio of the effective sky coverage to the actual sky coverage. This correction factor calibrates the expression for the Fisher matrix to the value obtained from the Monte Carlo approach. Here we show the ratio obtained from 100,000 simulations ( jagged line); the smooth curve shows the fit we use, eq. (16). Note that, since we are switching between weighting schemes, the correction factors are not expected to smoothly interpolate between regimes. Correction factor for the noise. The lines are as in Fig. 1. Note that, since we are switching between weighting schemes, the correction factors are not expected to smoothly interpolate between regimes. Unconverged Markov chains. The left-hand panel shows a trace plot of the likelihood values vs. iteration number for one MCMC (these are the first 3000 steps from one of our ΛCDM model runs). Note the burn-in for the first ~100 steps. In the right-hand panel, red dots are points of the chain in the (n, A)-plane after discarding the burn-in. Green dots are from another MCMC for the same data set and the same model. It is clear that, although the trace plot may appear to indicate that the chain has converged, it has not fully explored the likelihood surface. Using either of these two chains at this stage will give incorrect results for the best-fit cosmological parameters and their errors. 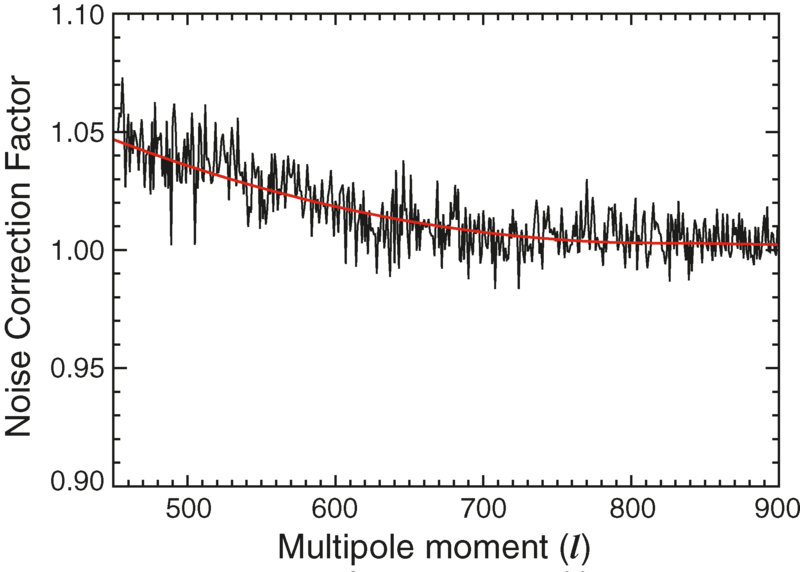 CMB angular power spectrum (in µK2) for our best-fit ΛCDM model for l > 800 and the Sunyaev-Zeldovich contribution for σ8 = 0.98 for CBI wavelengths (dotted line) and for ACBAR (dashed line). 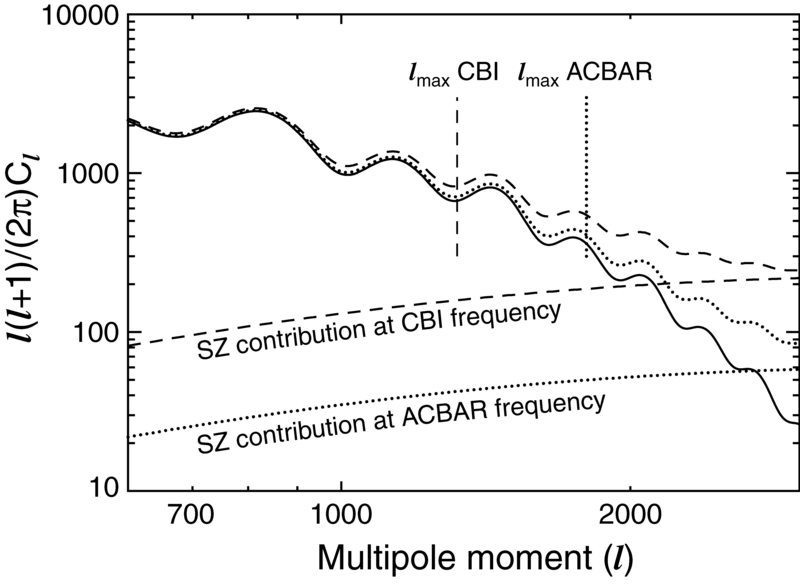 The vertical line shows the adopted cutoff for CBI and ACBAR. 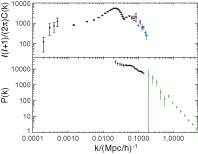 Combined CMB and LSS data set. 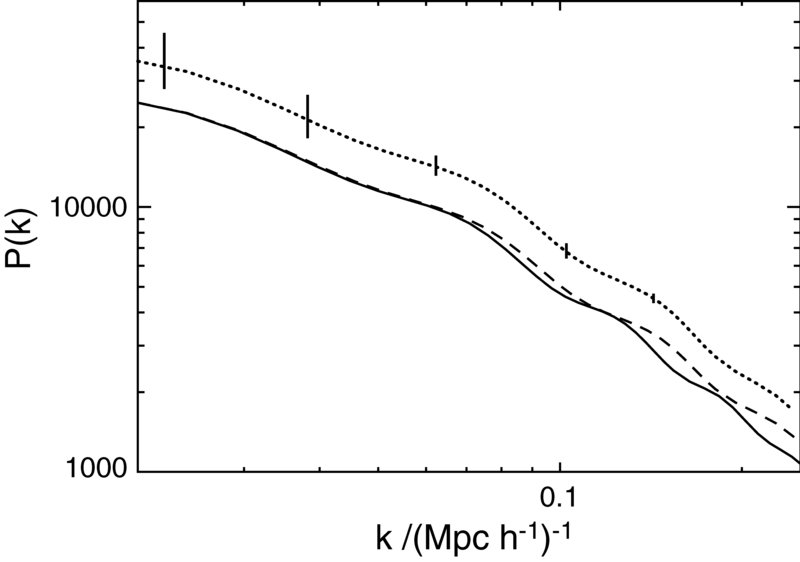 Top: CMB angular power spectrum in µK2 as a function of k, where k is related to l by l = η0k (where η0 ~ 14,400 Mpc is the distance to the last scattering surface). Black points are the WMAP data, red points CBI, blue points ACBAR. Bottom: LSS data. Black points are the 2dFGRS measurements, and green points are the Lyα measurements. Both LSS power spectra are in units of (Mpc h-1)3 and have been rescaled to z = 0. This plot only illustrates the scale coverage of all the data sets we consider. 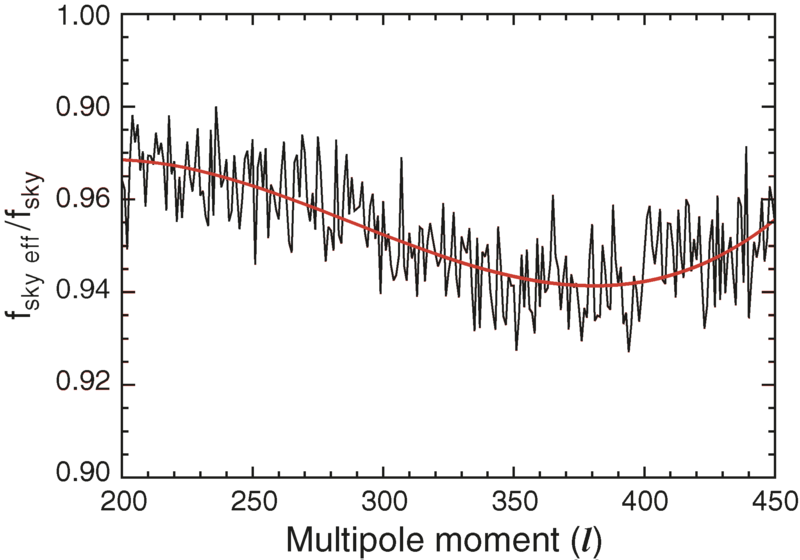 The various LSS power spectra as plotted here cannot be directly compared with the theory because of the effects outlined in § 5 (e.g., redshift-space distortions, nonlinearities, bias and window function effect). Matter power spectrum in (Mpc h-1)3, linear in real space (solid line), nonlinear in real space (dashed line), and nonlinear in redshift space (dotted line). 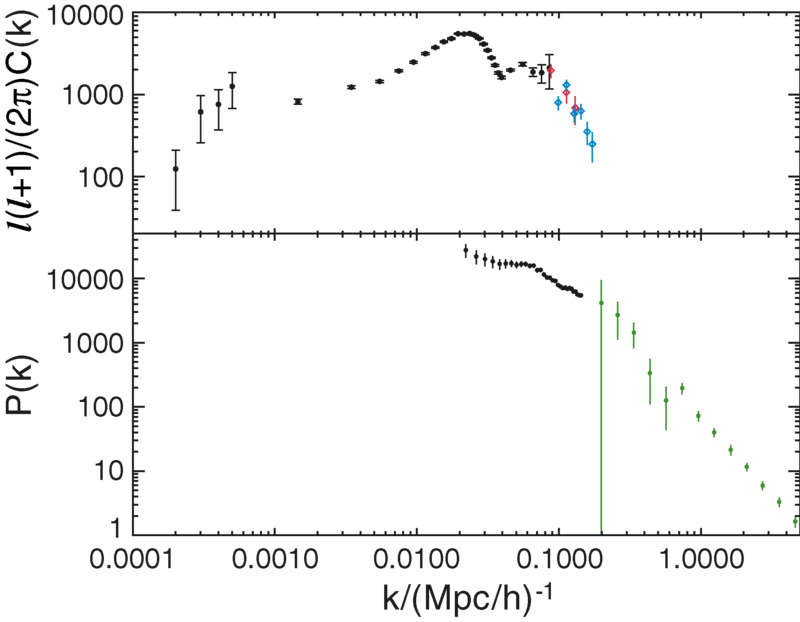 The error bars on the dotted line show the size of the statistical error bars per k bin of the 2dFGRS galaxy power spectrum. Two cosmological models: ωb = 0.0235, ωm = 0.143, ns = 0.978, τ = 0.11, w = -0.426, h = 0.53 (solid line) and ωb = 0.0254, ωm = 0.137, ns = 1.024, τ = 0.08, w = -1, h = 0.77 (dotted line). The two models are indistinguishable within current error bars from the CMB angular power spectrum (left-hand panel; units for the power spectrum are µK2). However, they can easily be distinguished if we can relate the observed power spectrum to the underlying matter power spectrum [right-hand panel; units for the power spectrum are (Mpc h-1)3]. The error bars on the solid line are examples of the size of the 2dFGRS and Lyα power spectra statistical error bars for one data point at different scales. There are four error bars for 2dFGRS and four for Lyα. Two cosmological models: Ωm = 0.26, ωb = 0.02319, τ = 0.12, ns = 0.953, ωv = 0, h = 0.714 (solid line) and Ωm = 0.26, ωb = 0.02319, τ = 0.12, ns = 0.953, ωv = 0.02, h = 0.6 (dashed line). As before the two models are virtually indistinguishable from the CMB angular power spectrum (left-hand panel; units for the power spectrum are µK2), but they can easily be distinguished if the matter power spectrum amplitude is known [right-hand panel; units for the power spectrum are (Mpc h-1)3]. The error bars on the solid line are examples of the size of the 2dFGRS and Lyα power spectra statistical error bars for one data point. There are four error bars for 2dFGRS and four for Lyα .